The Tideflex Series 37 In-Line Duckbill Check Valve is a simple, reliable, cost-effective solution for backflow prevention. The revolutionary design of the 37 is similar to the Series 35, but the Series 37 “bill” does not flare and is designed to be inserted into the downstream pipe and fastened between two mating flanges, eliminating the need for a valve body. Since most of the valve is inserted into the downstream pipe the face-to-face dimension of the 37 is just the flange thickness making it ideal for applications with space limitations. 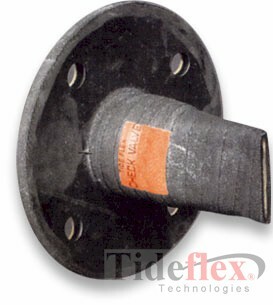 In order to fit down inside the pipe, the bill cannot flare and therefore the headloss of the 37 is higher than other styles of Tideflex. The 37 in not only installed in piping systems but is used extensively in concrete manholes and structures where the valve is inserted into the effluent pipe and the flange is anchored to the concrete wall with a retaining ring. The 37 flange size drilling conforms to ANSI Class 125/150# and is also available with DIN drillings and other standard or customized drilling patterns. The Series 37 Duckbill Check Valves are not supplied with retaining rings, as they are typically installed between pipe flanges, but retaining rings can be supplied for applications that require it.